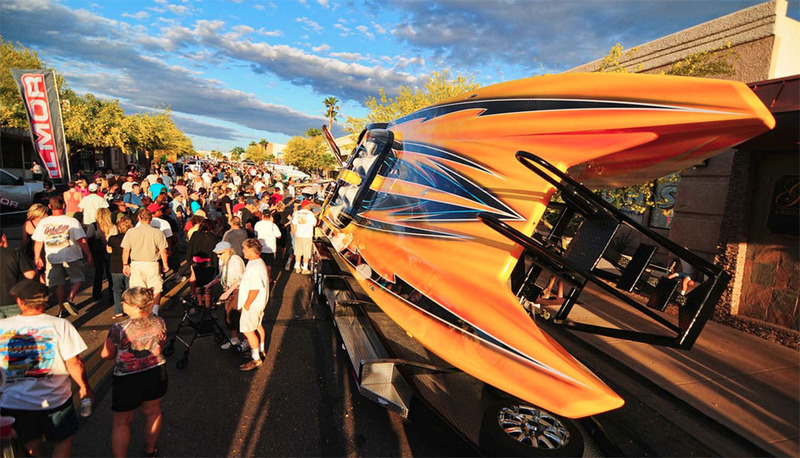 Desert Storm is Back in Lake Havasu for 2019 with a Street Party, Poker Run and Shootout! 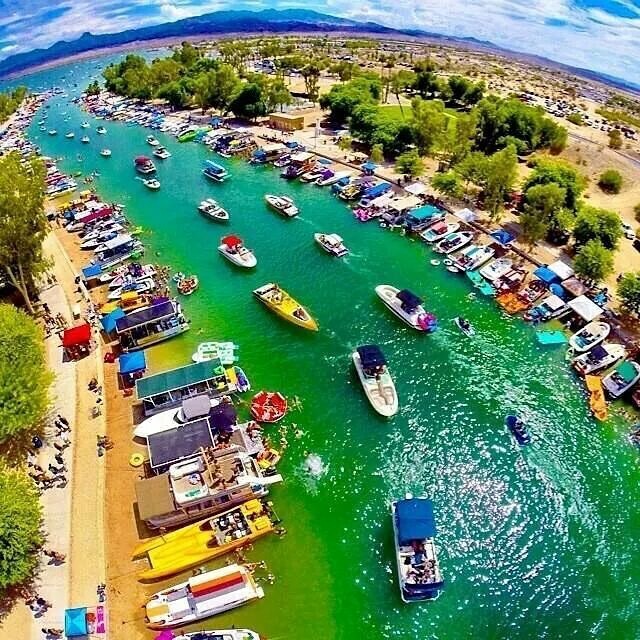 While other areas around the country are digging themselves out of the winter doldrums, Lake Havasu City boasts sunny skies and 80-degree weather. 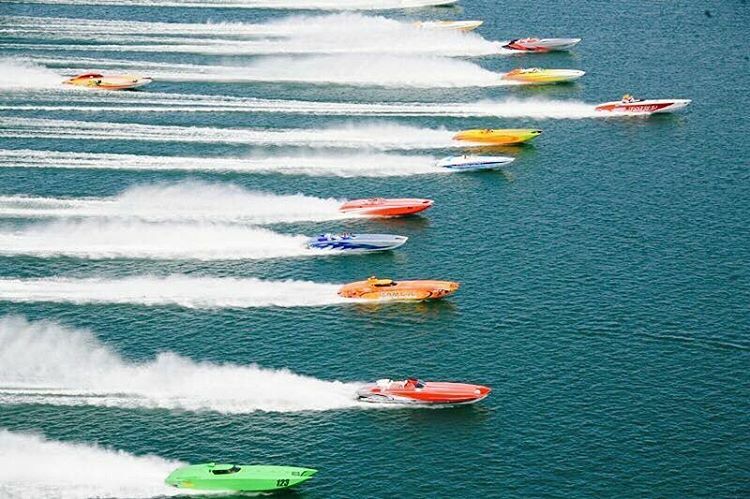 And in April, we welcome one of the most anticipated boating events of the year: the Desert Storm Poker Run and Shootout 2019. 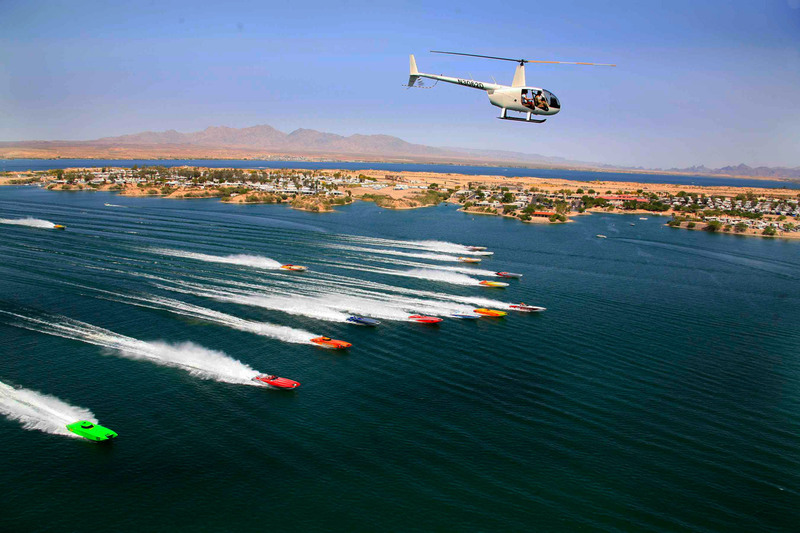 Performance boats from all over the country converge on Lake Havasu to compete for fun and prizes. You won't want to miss a minute of the action! The weekend's events kick officially kick off with a street party in downtown Havasu on Thursday, April 25th. This is where Desert Storm participants put their high-performance beauties on display. The public is invited, of course. Last year, over 10,000 hit the streets to see these boats up close. When you get hungry, slip inside one of the restaurants or bars for a bite to eat. Or visit one of the food vendors set up along the street. 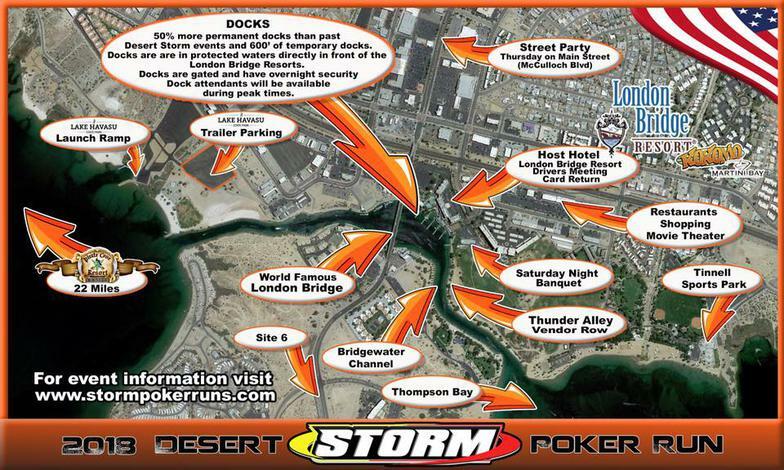 The Desert Storm Poker Run starts off with a huge parade through the Channel at 11 am on Friday, April 26th. Get there early, though, to secure a good vantage point along the Channel or at London Bridge Beach. After the parade ends, the run begins. Each team races around to various points along the lake to pick up a playing card. All hands must be turned in between 5 pm and 8 pm to be considered for a prize. The top three hands win 15% (3rd place), 25% (2nd place) or 35% (1st place) of the pot. On Saturday, all drivers race around a pre-set course on the lake, starting at the Site Six Launch Ramp. To watch, set up your lawn chairs anywhere along the bluffs between Site Six and Spectator Point. See map. Another area providing an awesome vantage point is at the Nautical Beachfront Resort. Racing starts at 10 am. If you plan on being out on the lake on April 26th or 27th, make sure you heed the racers as well as the course. Expect extra traffic on the lake those two days. And they'll be fast, too. Keep a heads up, especially when you have kids on board or are on a PWC, as these are harder for boat drivers to spot. And, please, for your safety and the safety of others, avoid jumping the wakes. All spectator events are provided absolutely free of charge, including the street party and parade.